On a Moroccan table, not salt and pepper, but salt and cumin. 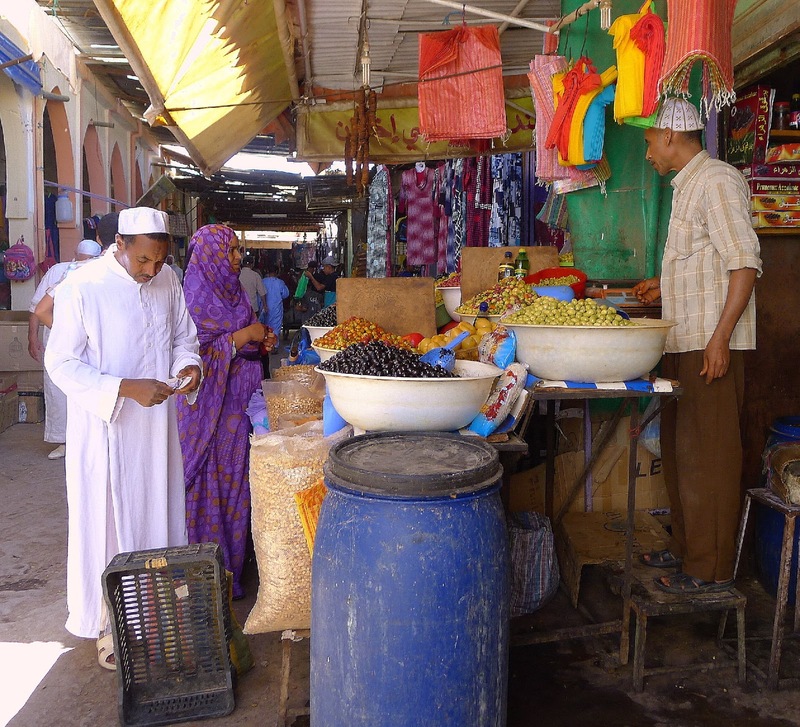 “Pass the salt and pepper, please” said one of my tablemates at our first meal in Morocco. I passed him two small ramekins, one a salt cellar and the other, presumably, containing pepper. “Not pepper!” he exclaimed. “What is it? Sort of like curry.” I tasted. Cumin, comino, in Spanish. 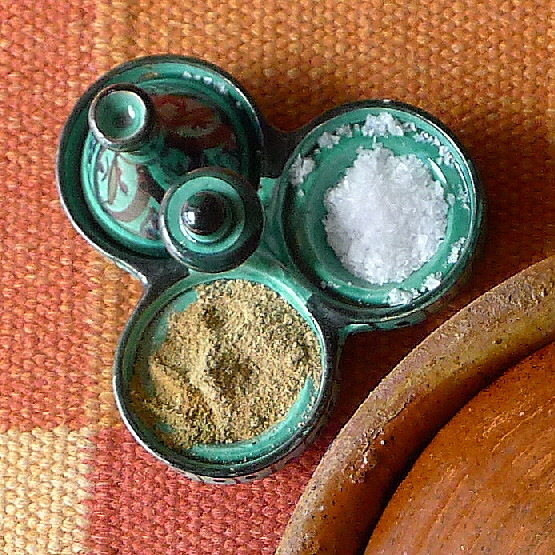 After salt, cumin is the most prevalent seasoning in Moroccan food. 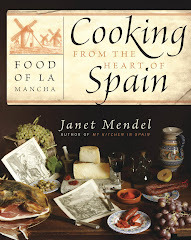 It’s added to many dishes during cooking and it’s placed on the table for each person to add according to taste. 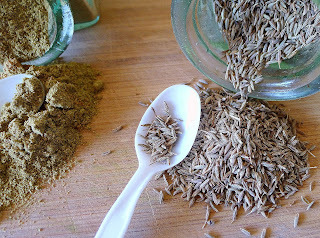 Whole cumin seeds and ground cumin. Toast the whole seeds and add, sparingly, to potatoes, beans, legumes. 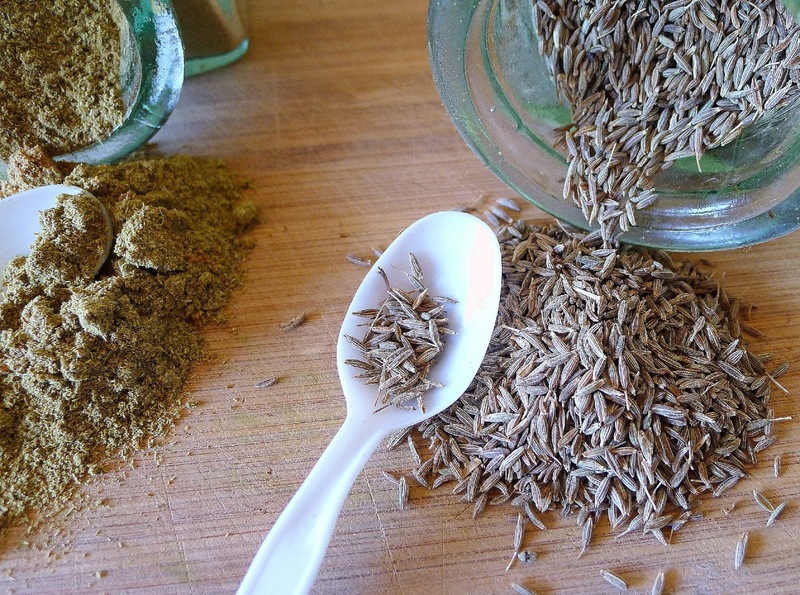 Cumin is the whole or ground seeds of a plant belonging to the same family as parsley, dill and caraway. Its aroma is pungent, nutty. Its taste, slightly bitter, warm and earthy. A native of south Asia and the Middle East, the spice has found its way into cuisines right around the world, especially in spice blends such as Moroccan ras el hanout; Indian garum masala and curry; Tex-Mex chili powder, and Latin American adobo. It’s often a cohort of hot chile. For instance, the tapa bar favorite, pinchitos, spicy mini-kebabs, is spiced almost identically to the brochettes grilled by street vendors in Morocco, heavy on the cumin, with a little heat from chile. In Málaga and Cádiz, pinchitos are usually made with pork, while in Tangier, just across the narrow Straits of Gibraltar, they are made with lamb or beef. Cumin even turns up in some versions of gazpacho. It’s used in that favorite Sevilla dish, espinacas con garbanzos, spinach with chickpeas, as well as with lentils and black-eyed peas. Surprisingly, a hint of cumin appears in Andalusian braised vegetables, such as asparagus, artichokes, fava beans and pumpkin. This Andalusian vegetable dish seasoned with cumin is a little like Moroccan tagine. I’ve been cooking a lot of Moroccan food since I returned from a week’s travels there (see the previous four blog posts for recipes). 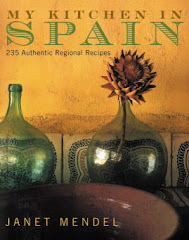 But this week I’m looking for cumin connections in Andalusian food. 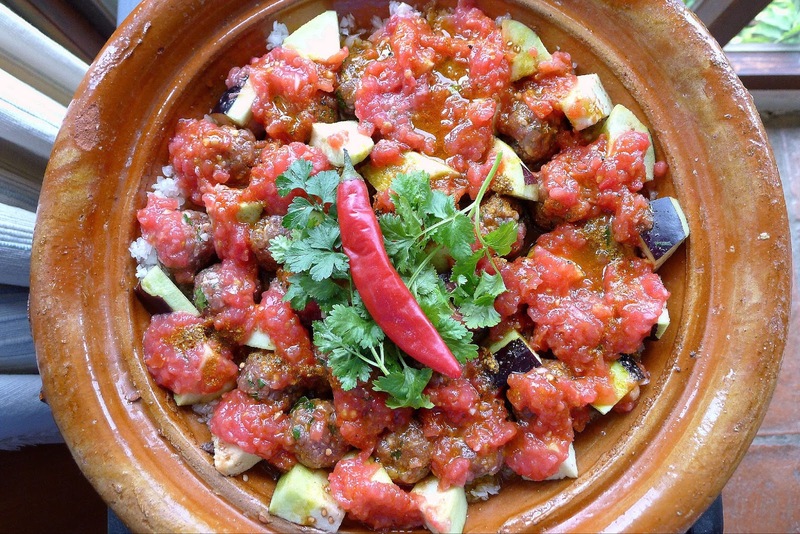 This is a village recipe—calabaza guisada, or stewed pumpkin—that reminds me a little of tagine, the Moroccan stew of vegetables and meat. 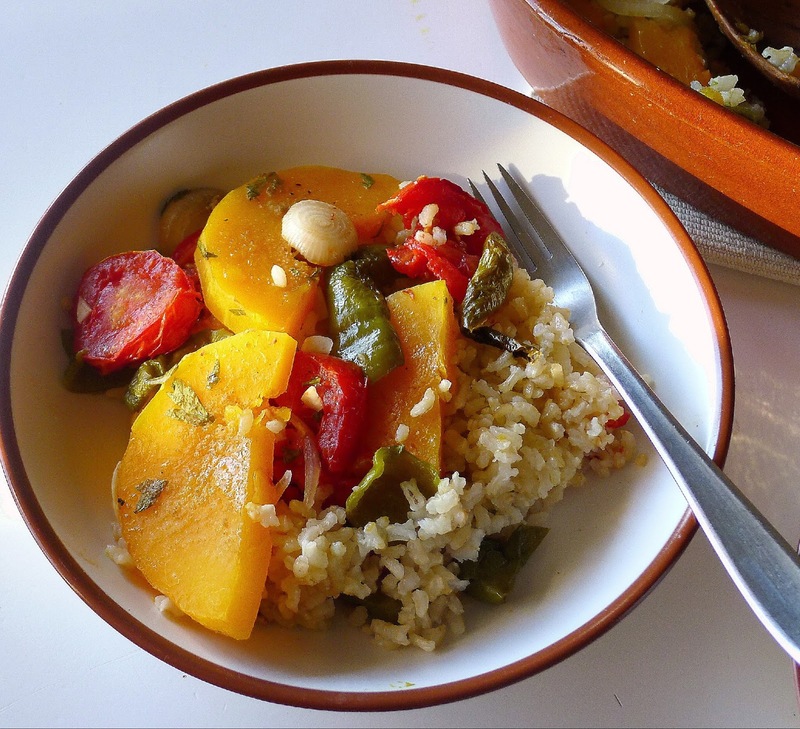 Brown rice makes this vegetable melange a vegetarian main dish. 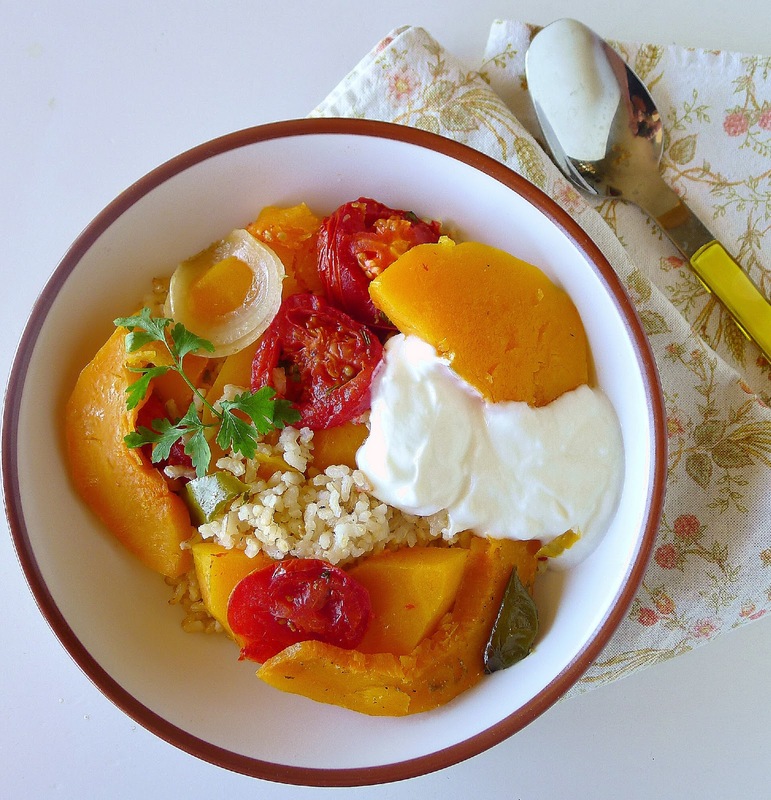 A dollop of yogurt is a good addition to rice with butternut squash. 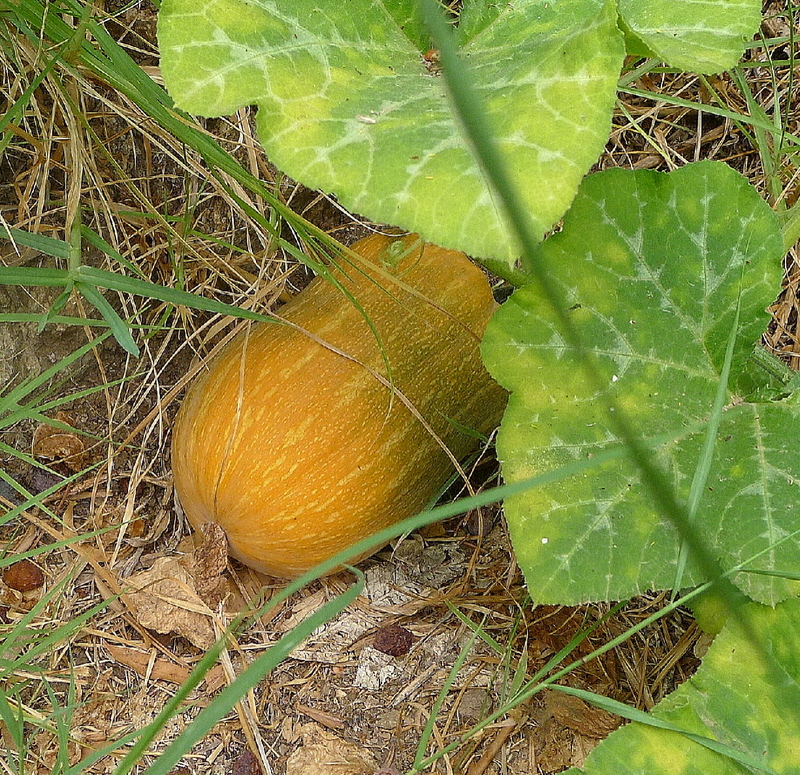 Butternut squash in my garden. The Spanish recipe calls for pumpkin, peppers, onion and tomatoes to be layered in a pan and simmered or baked until tender. I’ve turned the dish into a vegetarian main course, by baking all the veggies on top of a layer of brown rice. I’ve used butternut squash from the garden instead of the more traditional pumpkin. 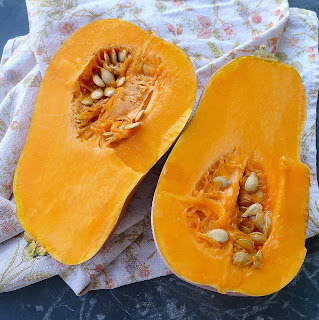 Cut the squash in half, remove seeds and peel. Slice it crosswise ½ inch thick. Spread the drained rice in the bottom of a lightly oiled cazuela or oven casserole. 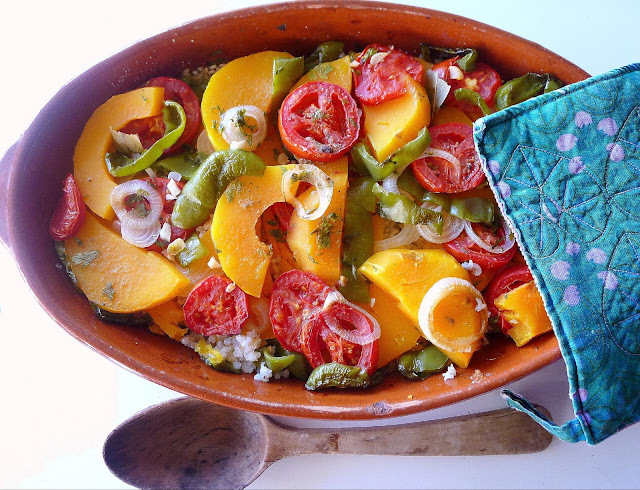 Layer the sliced squash, tomatoes, onion, green peppers and garlic on top of the rice. Break the bay leaf into pieces and tuck them among the vegetables. Sprinkle with parsley, cumin, salt to taste and pepper. Drizzle over the vinegar and oil. Pour over the boiling water. Cover the casserole with a lid or foil and bake until squash is tender, about 75 minutes. Serve hot or room temperature with a dollop of yogurt, if desired. In the desert, late afternoon sun turns the dunes to gold. 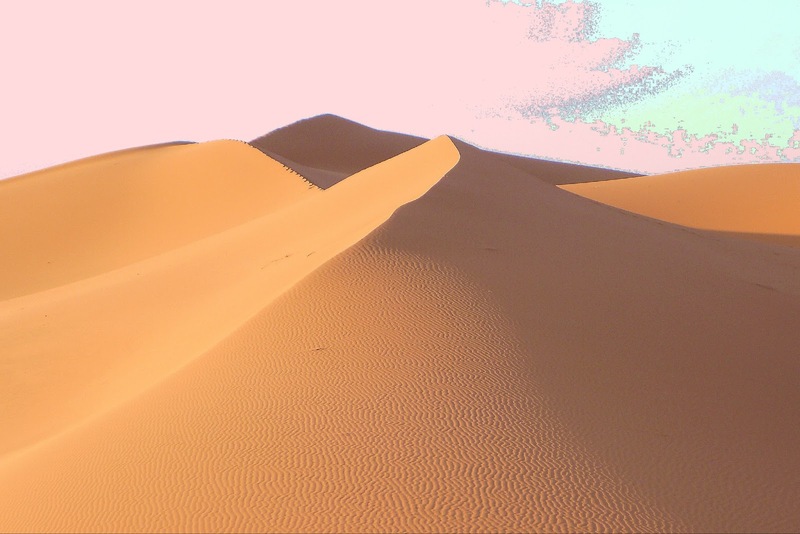 The late rays of sun turn the dunes golden orange. 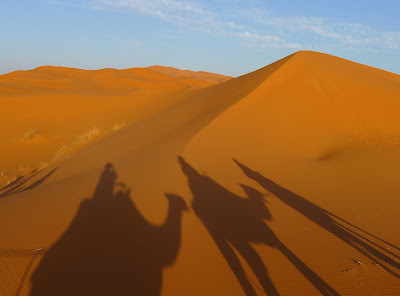 We are trekking by dromedary through the Erg Chebbi desert (southeastern Morocco), heading towards a camp of jaimas, for dinner, a night under stars and dawn on the Great Dune. As the sun descends, shadows grow long. The day’s radiant heat abates. Shadows grow long. Selfie with camel. 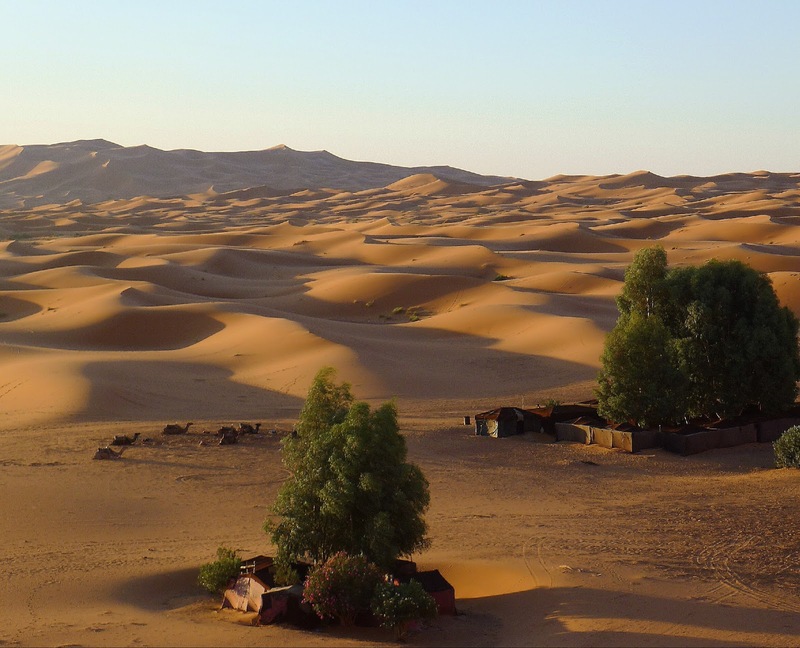 Camp for the night--tents in a watering hole set amongst the dunes. Camels wait outside the enclosure. The caravansary is a group of tents enclosing an open area with low tables and carpets spread on the sand. A few trees ring the enclosure that is tucked in the folds of a sea of dunes. The camels are parked outside for the night. What's for dinner? 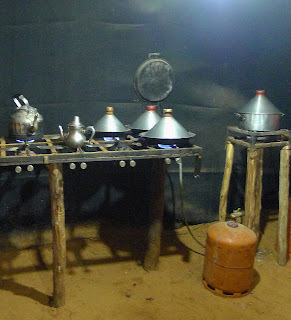 Tagine bubbling on a rustic cooker inside a tent. In a rustic kitchen, our dinner is bubbling away. Dinner is tagine. 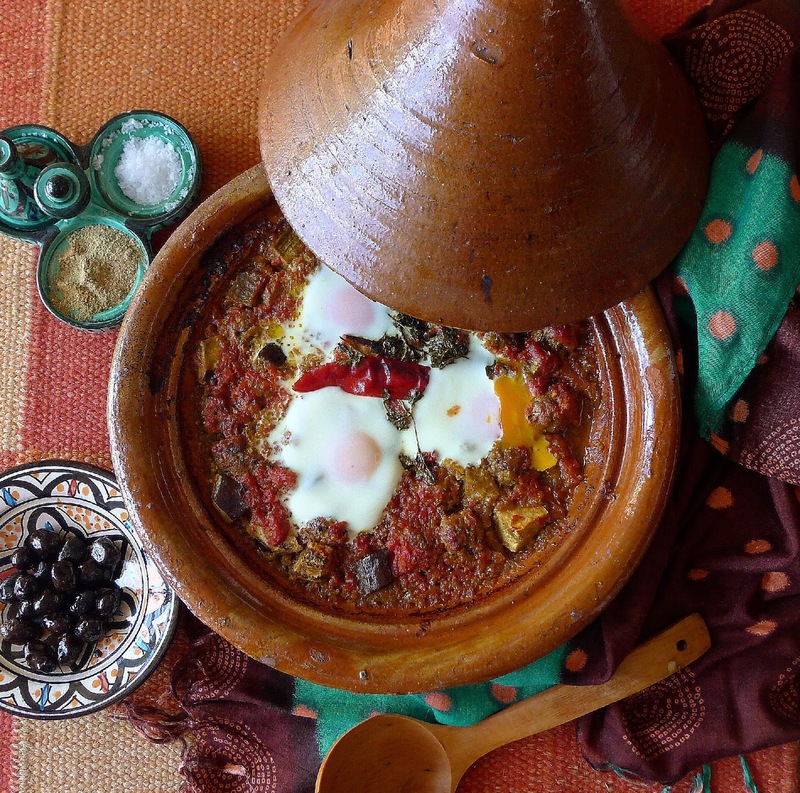 Tagine is the word for both the finished dish, a stew of meat and vegetables, as well as the cooking vessel, which is an earthenware or metal pot with a shallow base and conical lid. Morning. First rays of sun break over the dunes. Salutation to the sun. We've climbed a short way up the Grand Dune. In a week travelling in Morocco, I ate tagine every single day. There was beef with prunes (twice); kefta meatballs with eggs (twice); chicken with carrots, eggplant and potatoes, and chicken with preserved lemon and olives. 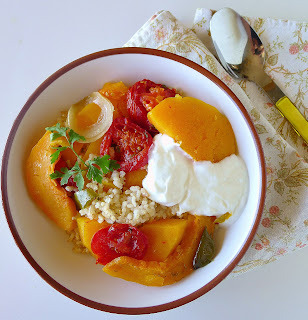 Tagine has long been one of my favorite dishes to cook for family and for guests. I love the simplicity of its preparation—ingredients are layered in the tagine with spices and a little liquid is added. 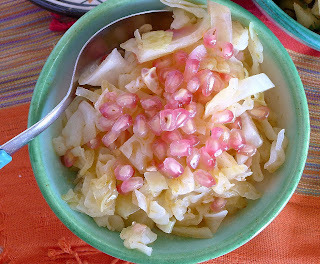 Grated onions in the bottom provide flavor and substance. On top, pieces of meat or chicken and vegetables simmer slowly beneath that conical lid. The lid traps steam and keeps it circulating, resulting in tender food, full of flavor. There’s no browning, no stirring. However, since I converted last year to an induction cooktop (requiring only steel pans), I haven’t prepared tagine at all. I decided that, instead of getting rid of the clay tagine, I would try it in the oven! 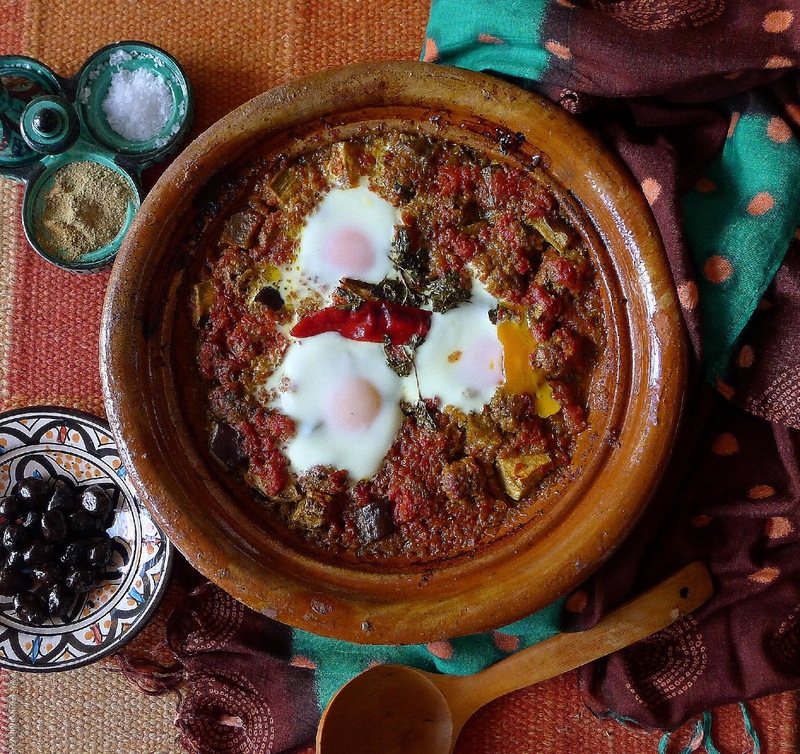 Tagine with kefta meatballs, eggplant, spices and eggs. This version has been cooked in the oven. A clay tagine is heavy. Take care in lifting it in and out of the oven. Remove lid first, taking care not to release steam towards your face. Then lift out the bottom. Place each on an insulated board, never on a cold surface. 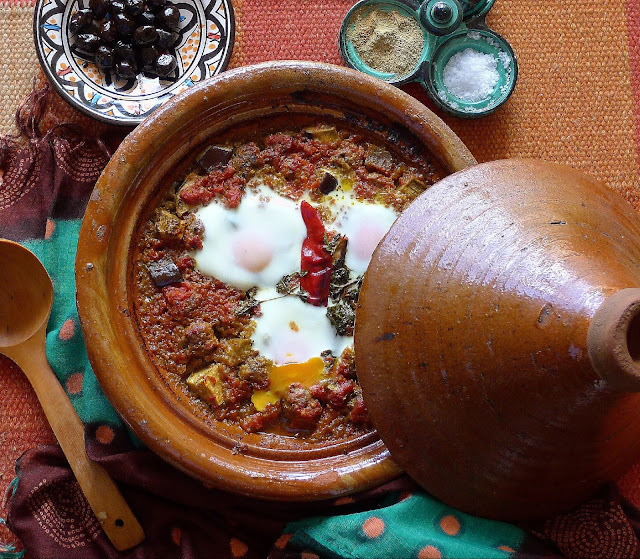 If you don’t have an earthenware or ceramic tagine, use an oven-safe lidded pan or shallow lidded casserole. Use a food processor to finely chop together the onion (2 or 3, depending on size) and garlic. Use it for both the meatballs and the sauce. Spices, too, are divided between meatballs and sauce. Bread for dipping into spicy sauce. 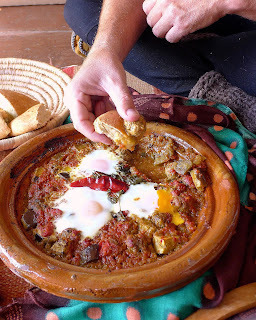 How to serve tagine. In a Moroccan home, the tagine is served on a low table. Family members sit around the table and eat right out of the tagine, using fingers and bread to help themselves to the delicious nuggets of meat and vegetables. 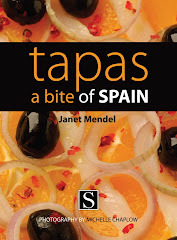 As part of a meal, the tagine might be served with soup or a selection of salads or an additional meat or chicken dish. It is not customary to serve rice or cous cous as a side with tagine. 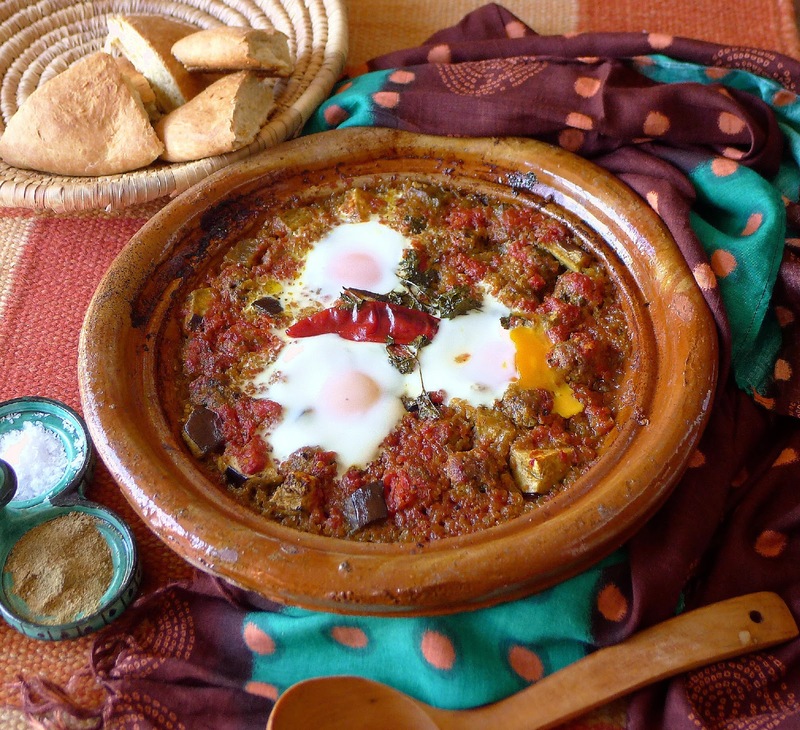 However, if tagine is the main dish, you may want to accompany it with more than just bread. Serves 4 to 6 as part of a meal. Place the meat in a bowl. Add 2 tablespoons of the chopped onion and garlic. Add 1 teaspoon each of salt, cumin and sweet pimentón. Add ¼ teaspoon each of black pepper and hot pimentón. Add a grating of fresh nutmeg. Add the chopped parsley and cilantro. Using hands, mix the meat and spices until they are combined very well. 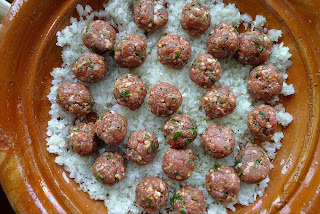 Shape the meat mixture into small (1-inch) balls. Place them on a sheet pan and refrigerate until ready to cook the tagine. Place kefta on a base of finely chopped onions. Place 2 tablespoons oil in the bottom of tagine or alternative lidded casserole. Spread the remaining chopped onion and garlic in the bottom of the pan. Place the meatballs in a single layer on top of the onions. Tuck the cubes of eggplant in among the meatballs. Spread the grated tomato pulp on top. Add the crushed saffron to the hot water in a small bowl and let soak 5 minutes. Add 1 teaspoon each of salt, cumin and sweet pimentón to the bowl. Add ¼ teaspoon each of black pepper, hot pimentón and cinnamon to the bowl. Stir in a pinch of turmeric. Stir in remaining 2 tablespoons of oil. Drizzle the spice-oil mixture over the tomatoes. Place sprigs of parsley and cilantro in the center and chile, if using, on top. Cover the tagine or casserole. Ready to cook--tomatoes and spices on top of the meatballs and eggplant cubes. 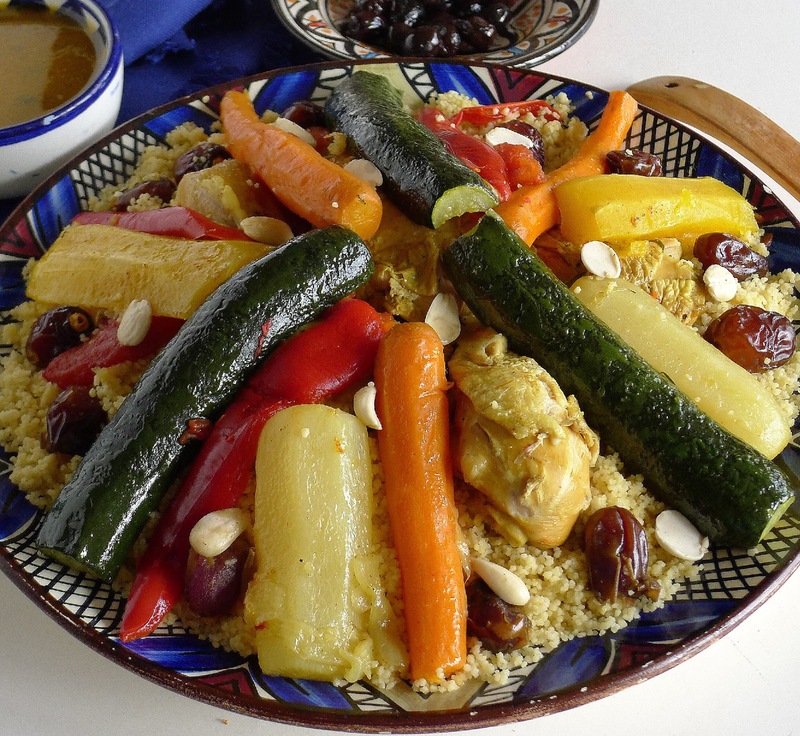 Place the tagine in a cold oven and set temperature to 350ºF (180ºC). Let the tagine cook 1 hour. Very carefully, lift off the tagine lid. Remove the tagine from the oven to check if it needs additional liquid. Do not stir it. 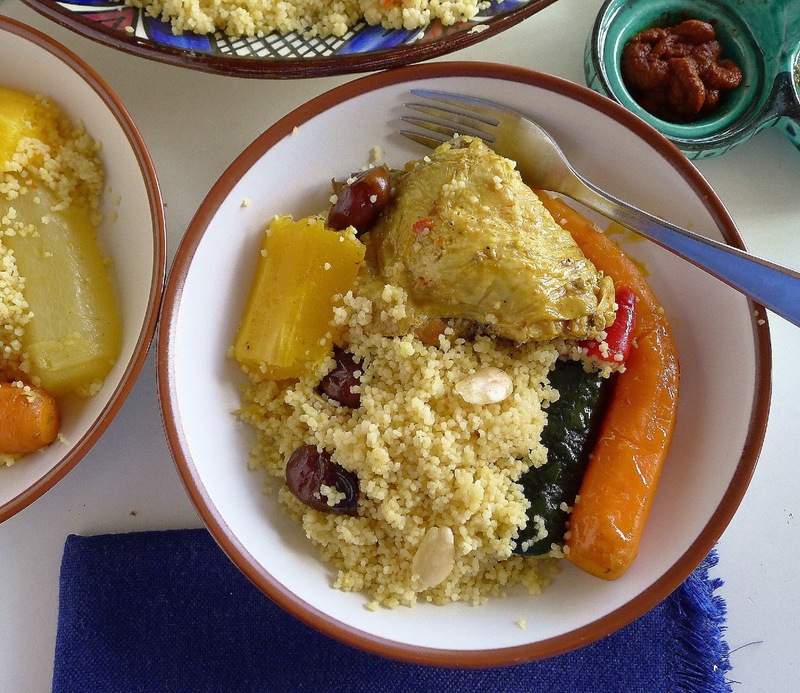 Return the tagine to the oven. Replace the lid. Cook 45 minutes more. Remove carefully, as before. Tomatoes should be thickened and eggplant very soft. Use a spoon to make indentations in the surface. Break an egg into each. Return the tagine to the oven and replace the lid. Cook until whites are set, but yolks still liquid, 8 to 10 minutes. Remove the tagine from the oven. Eggs will continue to cook from residual heat. Serve the kefta from the tagine, removing the lid when the tagine is placed on the table. Accompany with bread. Place the tagine right on the table. Not one egg per person--expect to break up the eggs when serving. 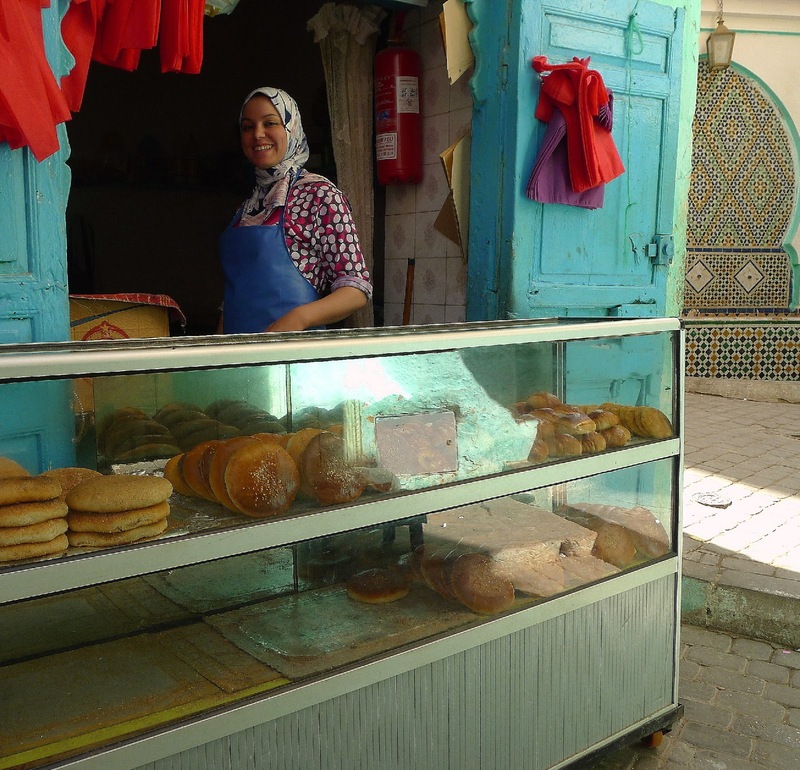 Bread is the essential accompaniment to tagine. Another recipe for tagine: Chicken Tagine with Olives and Lemon. 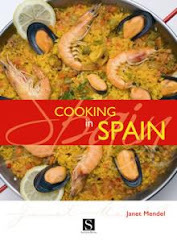 More about clay-pot cooking in the oven: Baked Rice and Seafood Cazuela. Erg Chebbi, desert near Merzouga, Morocco. 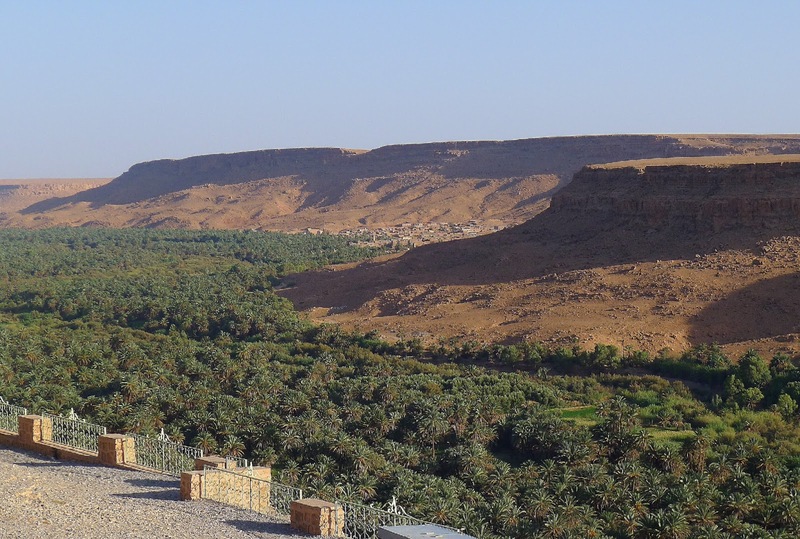 World's largest palm oasis, in the valley of the River Ziz. 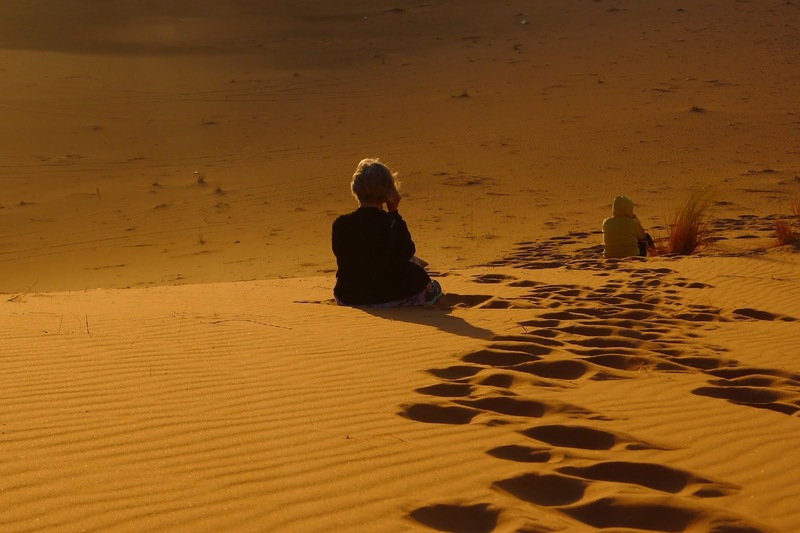 Morocco continually surprises. We drove through miles and miles of desolate, arid, rocky landscape, then, suddenly, pulled over to overlook a lush, green palm oasis. A river of green trees, where small, walled settlements—casbahs—follow the valley, flows in the bottomland of the River Ziz. Dates, almost ready for harvest. 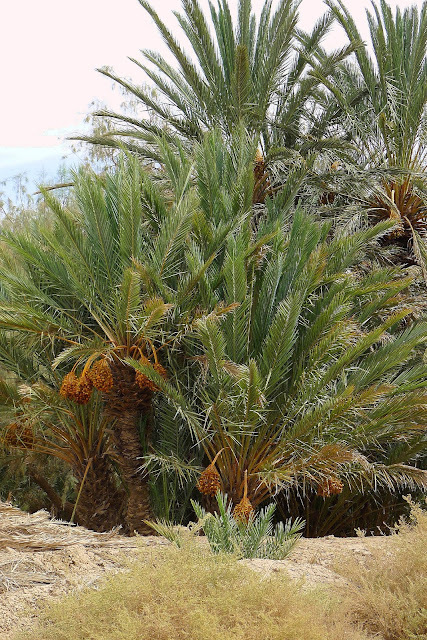 The palm oasis—possibly the world’s largest—is also the source of Morocco’s date harvest. Right now (mid-October) is harvest season. I was there a few weeks earlier, when huge bunches of dates were still ripening at the tops of the palms. 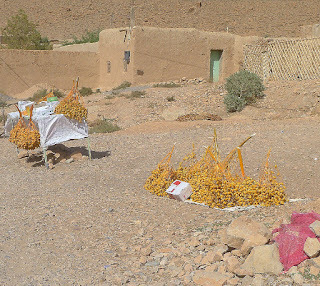 Date palms laden with ripening fruit, near Erfoud, Morocco. We dropped down to the valley floor, zig-zagging through palm trees and gardens to arrive at Maison Zouala, an old Berber home that has been turned into a guest house. Our host, Mhamed (Hami) Oukhouya, served us a marvellous cous cous and an orange and date salad. 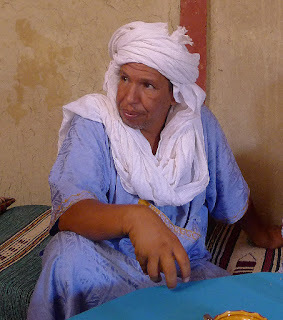 Hami, of Maison Zouala, tells us about dates and the philosophy of inshallah. 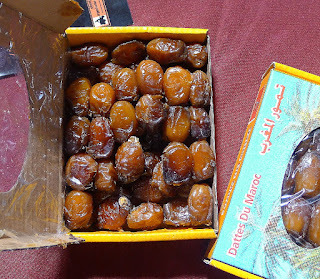 Tafilatet dates are incredibly sweet. The dates of the Tafilalet region, Hami said, are the Medjool variety, although they differ from California Medjools. 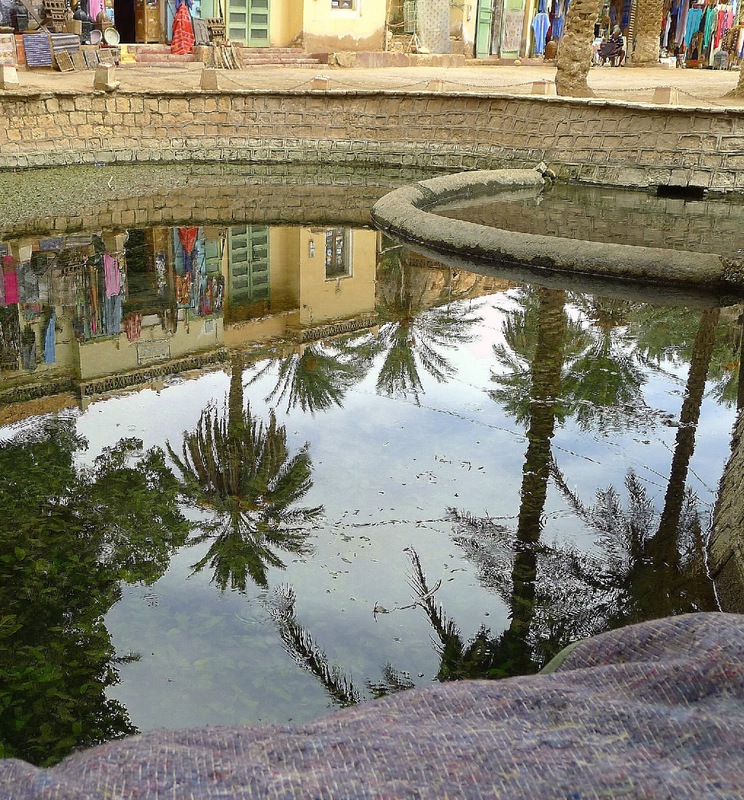 Over centuries, the Moroccan date palms have adapted to local climate and soil conditions. They are incredibly soft and sweet. Interestingly, Arab and Berber settlers carried palm trees to Spain in the 10th Century AD. 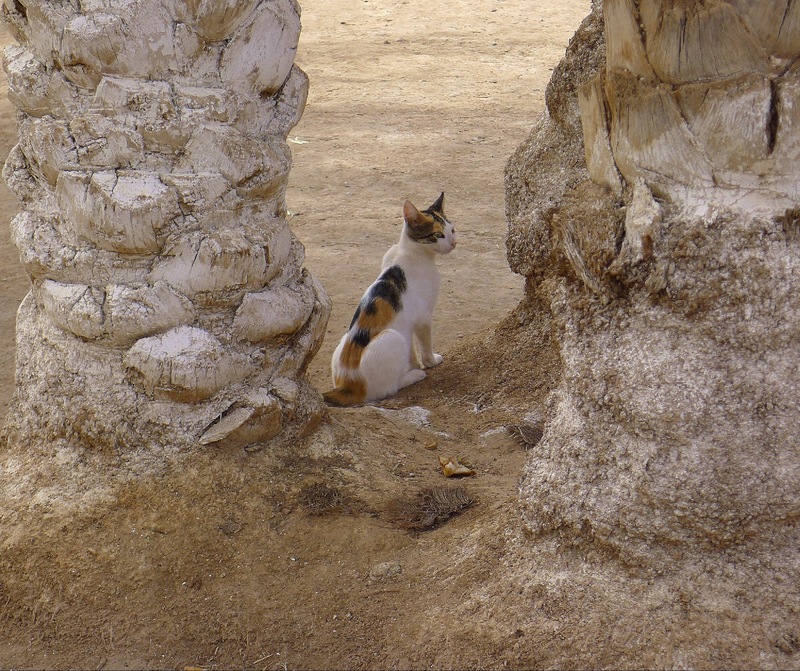 They were planted in the area of Elche (Alicante, eastern Mediterranean Spain). Using the same methods as in North Africa, palms were placed along boundaries of irrigated plots to maximize water retention. Elche has Europe’s largest date palm plantation, although because its climate is marginal, fruit doesn’t properly ripen. And, then, Spanish colonizers established the date palm on California missions in the 17th century. The Morocco connection. Date palms reflected in the waters of a natural spring. 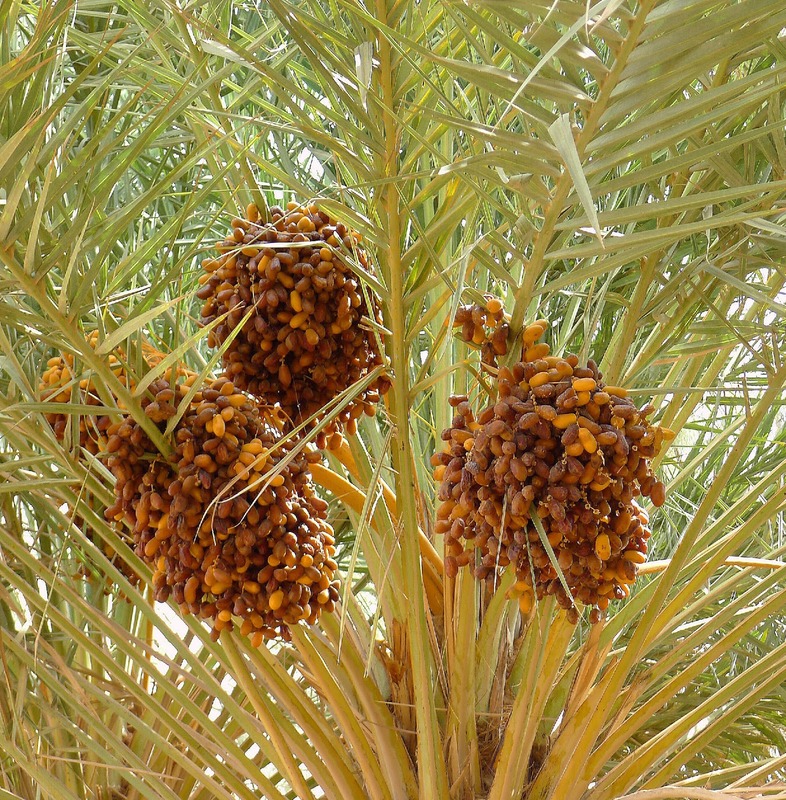 Dates need their "feet in the water, their head in the fire," meaning groundwater for the roots and hot desert, low humidity, for the foliage and fruit ripening. 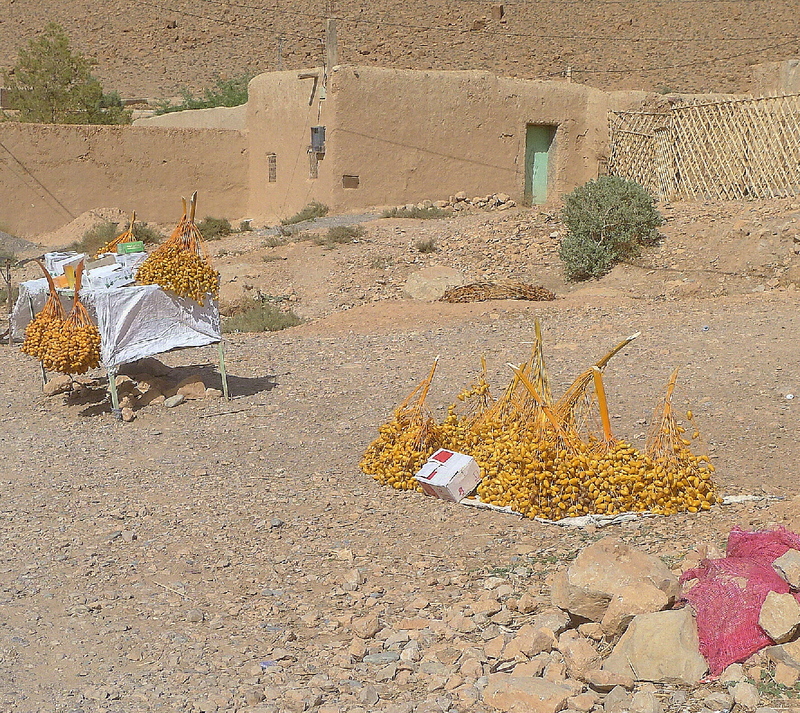 A roadside stand selling unripe yellow dates. At the foot of date palms. Sweet dates stud fluffy grains of cous cous with chicken and seven vegetables. This cous cous recipe is based on one found on a web page about Moroccan food products, (Page 22 http://www.agriculture.gov.ma/sites/default/files/terroirs-of-morocco.pdf. 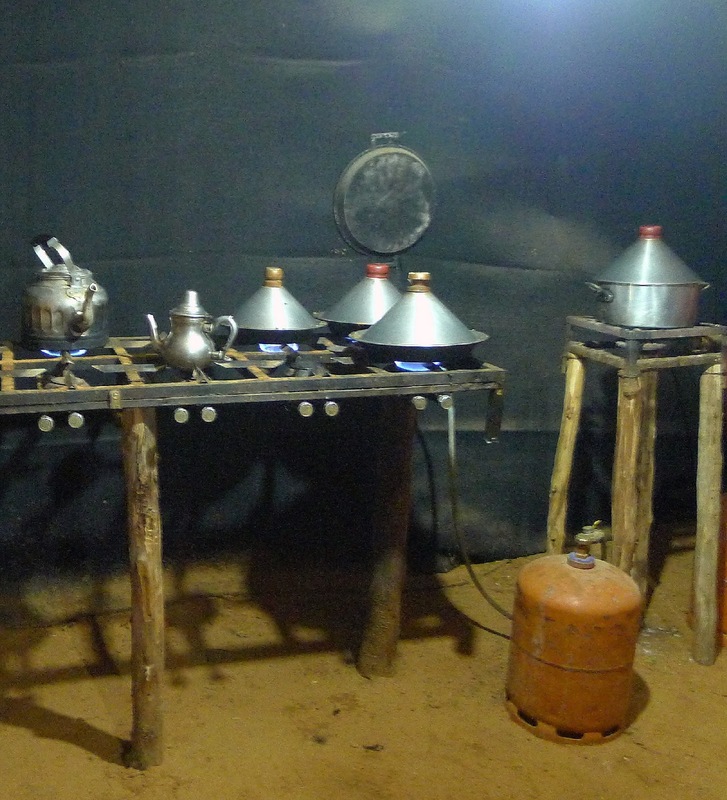 According to that site, it takes six women (of a cooperative) eight hours to prepare 50 kilos of cous cous. Paula details how to dampen the grain, then steam it twice over the pot of simmering stew. Her very important note: “If the stew in the bottom of the cous cous pot is fully cooked and well seasoned prior to the final steaming of cous cous grains, you should transfer the stew to a separate saucepan, keeping it warm, and perform the final steaming over boiling water.” While it’s ok to cook the chicken until falling off the bones, try not to cook the vegetables until they disintegrate. Seven is a “lucky” number, but not fixed. Vegetables such as eggplant, cabbage, sweet potatoes, fava beans and artichokes can be added to the stew. Beef or lamb, cut in chunks, can be used instead of chicken. Most cous cous recipes call for salted butter as well as oil to prepare the cous cous. I've used only olive oil. I'm using a cous cous steamer I bought in Morocco 50 years ago! It has a perforated bottom. It should fit tightly over the big stew pot (this one is not the original). If you don't have a cous cous steamer, use a heat-proof colander. Tie a dampened cloth around the join between steamer and pot so no steam escapes around the sides. Serves 6 to 8. You may need to serve the cous cous, chicken and vegetables on two platters. Seven vegetables, give or take a few. Sprinkle the chicken pieces with salt and pepper. 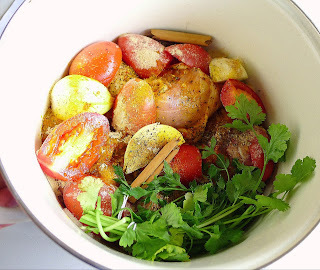 Chicken, vegetables, spices and herbs go in the pot raw. Place 3 tablespoons of oil in the bottom of a large stew pot. Cut 1 onion into wedges and place in the bottom of the pot. Place the chicken pieces on top. Cut the second onion into quarters and tuck them in with the chicken pieces. Add the halved tomatoes. Crush the saffron in a mortar. Place it in a small bowl and add 1 tablespoon of hot water. Let it infuse 10 minutes. Add 1 tablespoon of salt, 1 teaspoon of black pepper and the ginger, turmeric, cinnamon and herbal bouquet to the pot with the chicken. Drizzle with 3 tablespoons more of oil. Place the pot on a medium heat and cook, covered, 10 minutes. Add the 10 cups of water and the saffron water. Bring the liquid to a boil, then reduce heat and simmer, covered, 45 minutes. Peel carrots and, if they are large, cut them in half lengthwise. Add carrots and turnips to the pot with the chicken. Prepare cous cous for cooking according to following procedure. Steam cous cous over the chicken-vegetable stew for 15 minutes. 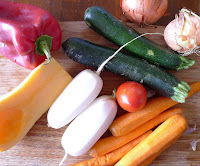 Add zucchini, butternut squash and red bell pepper to the stew. Place cous cous over the stew to steam with the dates for 20 minutes. To serve: mound cous cous on a large platter. Use a slotted spoon to remove chicken pieces from the big pot. (If chicken is falling off the bone, discard bones.) Place chicken around the cous cous. Discard herbal bouquet, cinnamon sticks and any loose tomato skins. 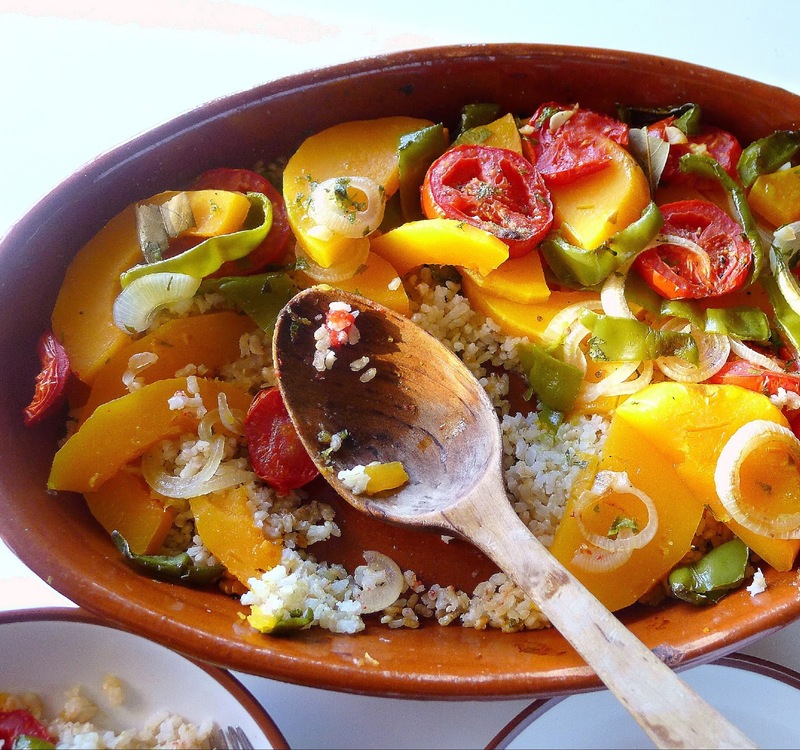 Place vegetables on top of cous cous. Garnish with the dates and almonds. Ladle some of the cooking liquid into a bowl and serve it alongside the platter of cous cous, chicken and vegetables. Use wooden fork to break up lumps in dampened cous cous. Place cous cous in a shallow pan and add 2 cups of water. 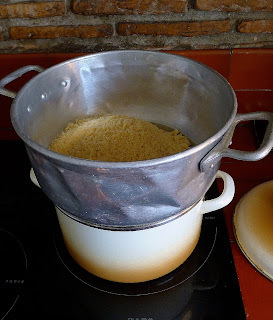 Sluice the water through the grain, then pour into a fine sieve to drain off excess water. Return the cous cous grain to the pan and let it dry 20 minutes. Rake it through with a wooden fork or fingers to break up lumps. Ladle the cous cous into a cous cous steamer or heat-proof colander that fits over the big stew pot. Bring the contents of the pot to a boil, place the steamer on top, uncovered, then reduce the heat so the stew just bubbles and steam gradually rises through the cous cous. Steam the cous cous 15 minutes. Turn the cous cous out into the shallow pan. Spread it to dry for 5 minutes. Sprinkle with ¼ cup cold water and 1 teaspoon salt. Add the dates to the cous cous. Drizzle with 2 tablespoons of oil. 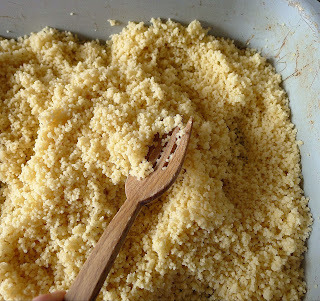 Use the hands to spread the oil through the cous cous, breaking up clumps of the grains. Return the cous cous to the steamer and place it over the stew. Steam for 20 minutes. To serve: mound the cous cous on a large platter. Place the chicken and vegetables on top of it. Stud the cous cous with the steamed dates. 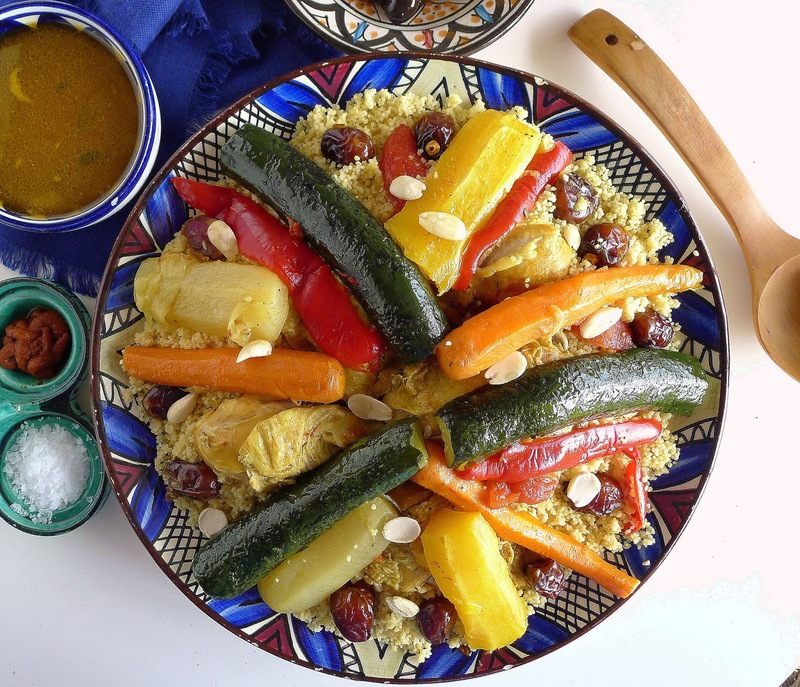 Serve cous cous with chicken, vegetables and dates. Serve harissa chile sauce on the side. 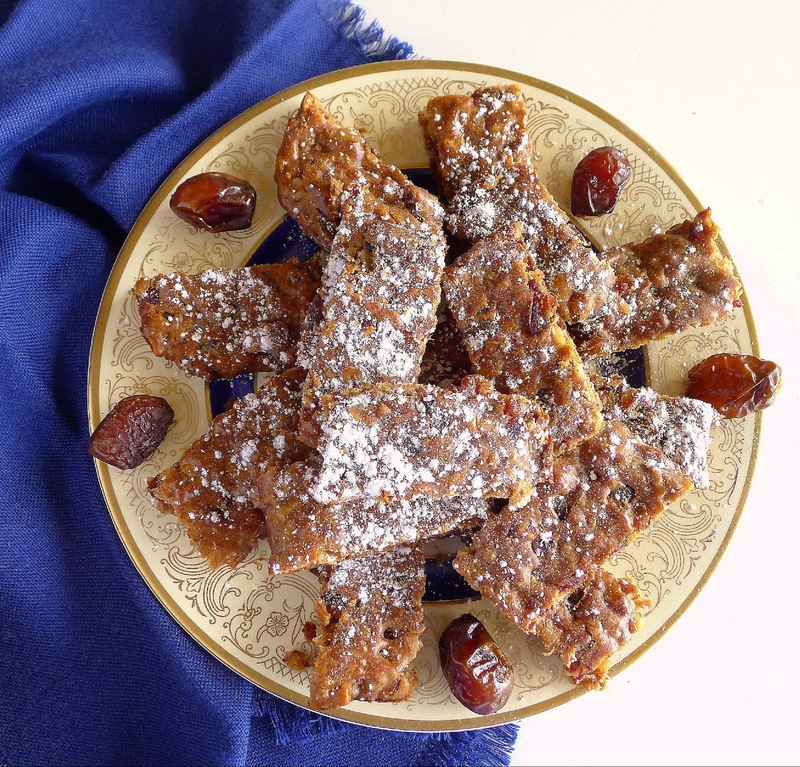 A holiday treat, date bars. 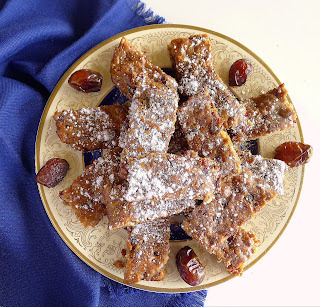 For me, dates signify a special occasion because, when I was growing up, dates were a treat for holidays, when my mother made her famous Date Bars, chewy squares, chock full of nuts and sweet dates. My mother’s recipe for Date Bars, from The Settlement Cook Book (by Mrs. Simon Kander; around 1942), called for melted butter and one cup of sugar. I have substituted olive oil for the butter and eliminated the sugar completely. Dates are so incredibly sweet that I don’t think you’ll miss the sugar. Sift together the flour, baking powder, soda, salt and cardamom. In a mixing bowl, beat the eggs. Beat in the oil, water and lemon zest. Stir in the dry ingredients to make a smooth batter. Fold in the dates and nuts. Preheat oven to 350ºF. Oil a rectangular baking pan (7X12 inches). Spread the batter in the pan. Bake until top is springy when pressed, about 20 minutes. Cut into bars while still warm. Dust with confections’ sugar, if desired. 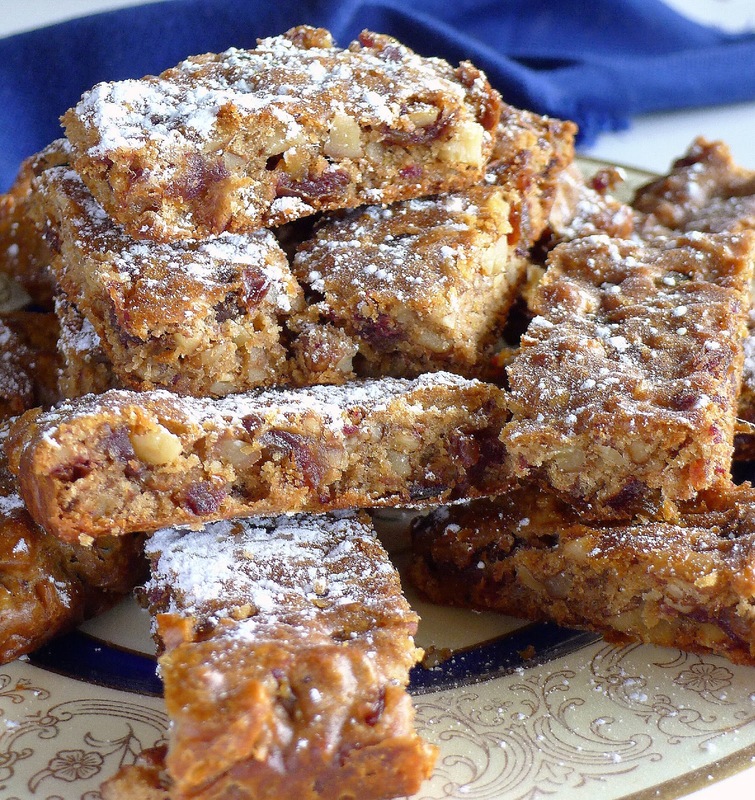 Chewy date bars are chock full of sweet dates and nuts. Moroccan dessert: sliced oranges with orange blossom water, cinnamon, dates. Usually with almonds, but I've added seasonal pomegranate seeds instead. 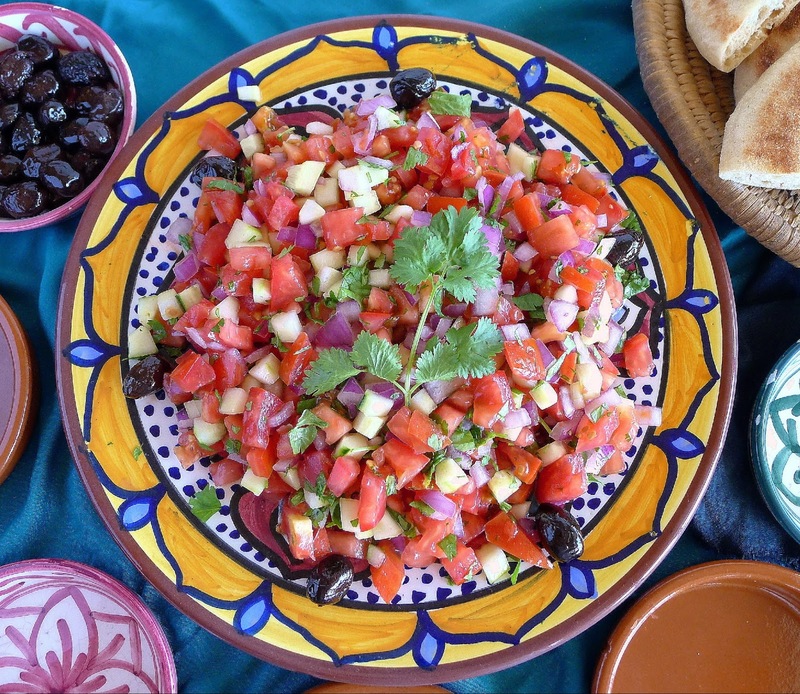 On our first night in Morocco, at a guest house in the medina of Azrou, a town south of Fes in the Middle Atlas, Fatima placed a salad of chopped tomatoes, onions and cucumber on a tiled table on a rooftop dining area. Lightly dressed with oil, the salad was accompanied by tiny bowls of salt and ground cumin for additional seasoning. A variation of this fresh salad, shlada, appeared as a starter before many Moroccan meals. Moroccan salad of chopped tomatoes, onions and cucumbers--much like Andalusian pipirrana. I was part of a photography landscape tour to Morocco. But, really, I was on a salad tour. My photography skills improved a little (thanks to Antonio Martín). My salad appreciation grew hugely as I sampled many variations, from the northern port of Tangier, almost touching Spain, to the distant desert of Merzouga, on the southeastern border of Morocco. The River Ziz cuts a valley through an arid, desolate landscape of the Middle Atlas. We drove through the Atlas Cedar Biosphere Reserve, home of majestic cedar trees, Barbary macaques and vendors peddling cedar bowls. 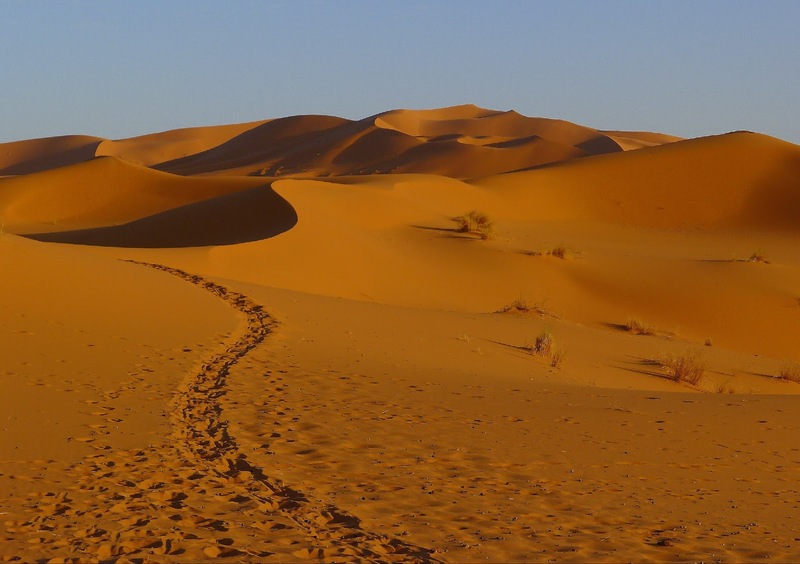 Through desolate, arid, rocky landscapes. Where it seemed nothing could thrive, there would appear a herd of sheep, a lone donkey (much smaller species than the burro-taxi of Mijas), a pair of veiled women standing beside the road (bus stop? ), a solitary tree. 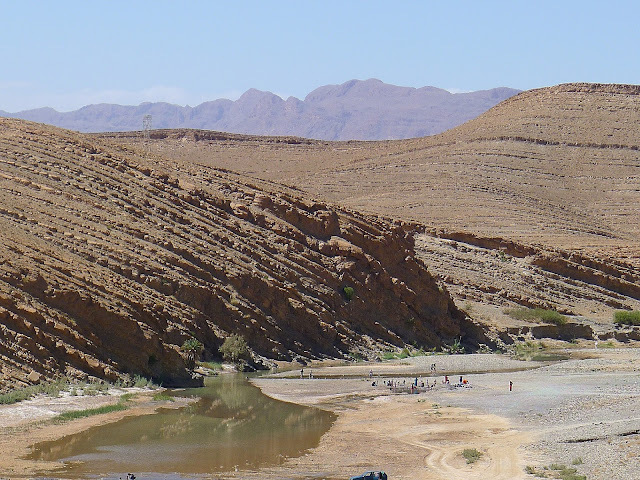 Then, down from the rocky slopes into the Ziz Valley palm oasis, for lunch at Maison Zouala, an old Berber house, where our host, Hami, offered cold water and dates in welcome. 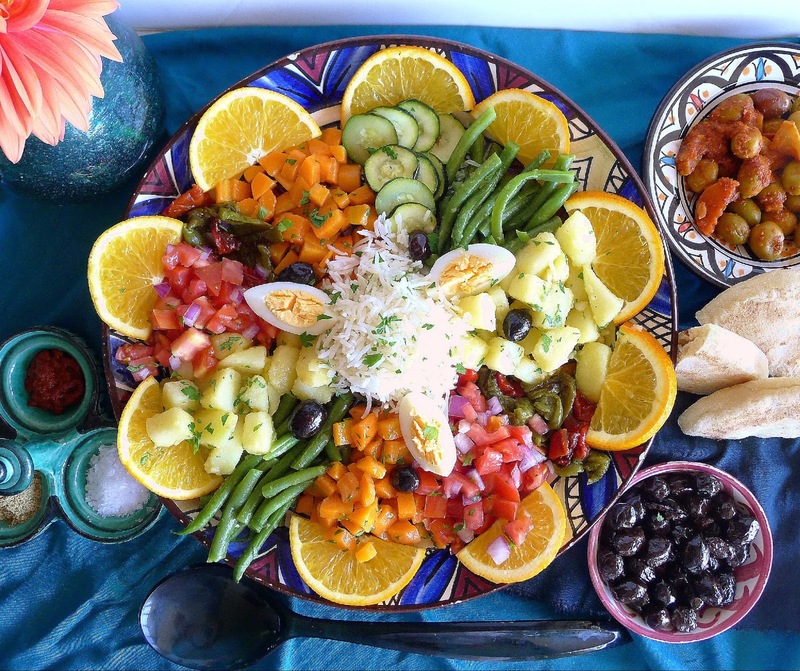 Lunch began with a huge “presentation” salad—potatoes, tomatoes, roasted peppers, carrots, zucchini and green beans arranged on a platter and garnished with quartered egg, olives and sliced oranges. 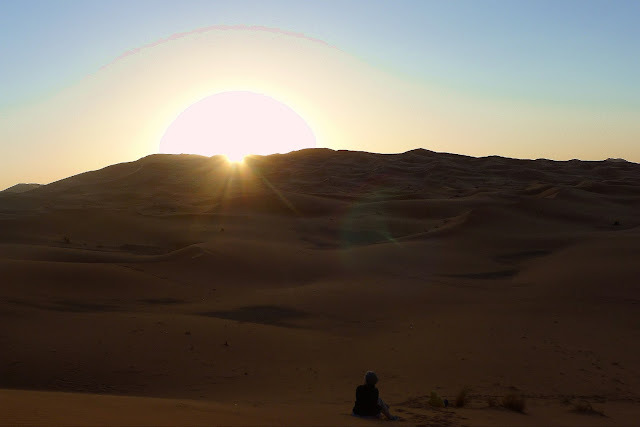 By evening we reached our destination, Hotel Les Dunes d’Or (the “golden dunes”), an oasis on the edge of the desert near Merzouga, on the Algerian border of Morocco. On the terrace near the pool, a slight breeze was a welcome respite after the 100ºF+ temperatures during the day. Another chopped tomato salad refreshed the spirits. After a morning haggling for scarves, shirts, necklaces, pantaloons and the like in the souk of Rissani (and joking about buying a tender kid-goat at the livestock market), we headed for lunch at the upstairs dining room of the Restaurante Panorama, overlooking the bustling market square. The classic chopped tomato salad here had corn kernels as a garnish. The salad was the perfect accompaniment to chicken brochettes with a side of fries with Arabic ketchup and mustard! Olives in the souk of Rissani. Black Moroccan olives are intensely salty and oily. Pale green ones are somewhat like commercial Manzanilla olives. 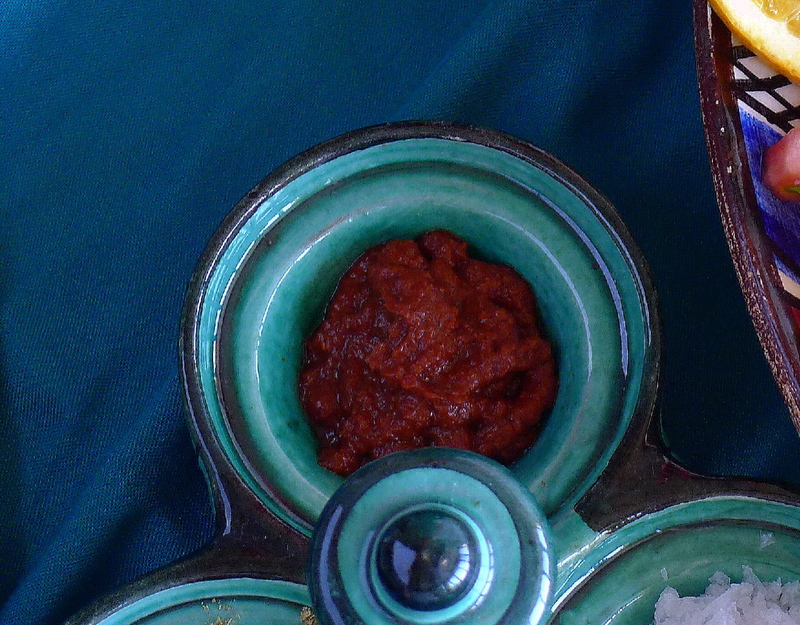 Purple olives in red paste are fiery-hot from harissa chile. 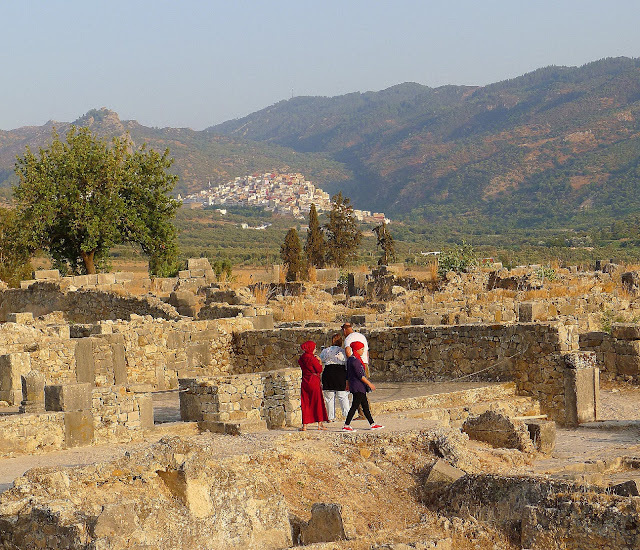 On the return trip from the desert of the south to the ferry port of Tangier, we stopped in the holy city of Moulay Idriss in order to visit nearby Roman ruins of Volubilis. There Romans were producing olive oil in the 2nd century AD. The town of Moulay Idriss rises on the hills above the Roman ruins of Volubilis. This was olive-producing land in the 2nd century AD. 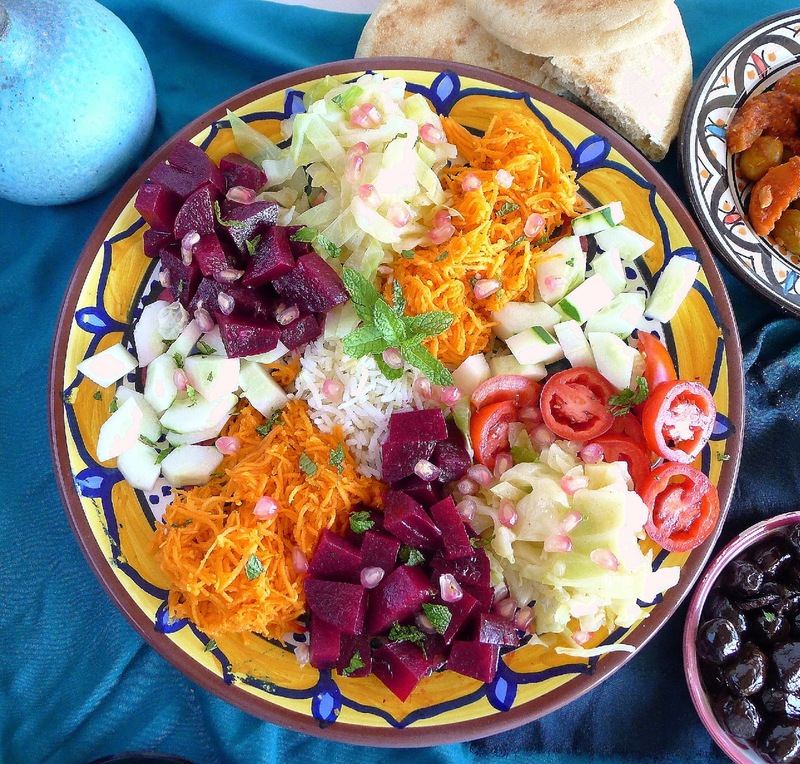 At the Dar Zerhoune guest house in the medina, dinner began with an assortment of salads served in separate bowls, much like Spanish tapas. 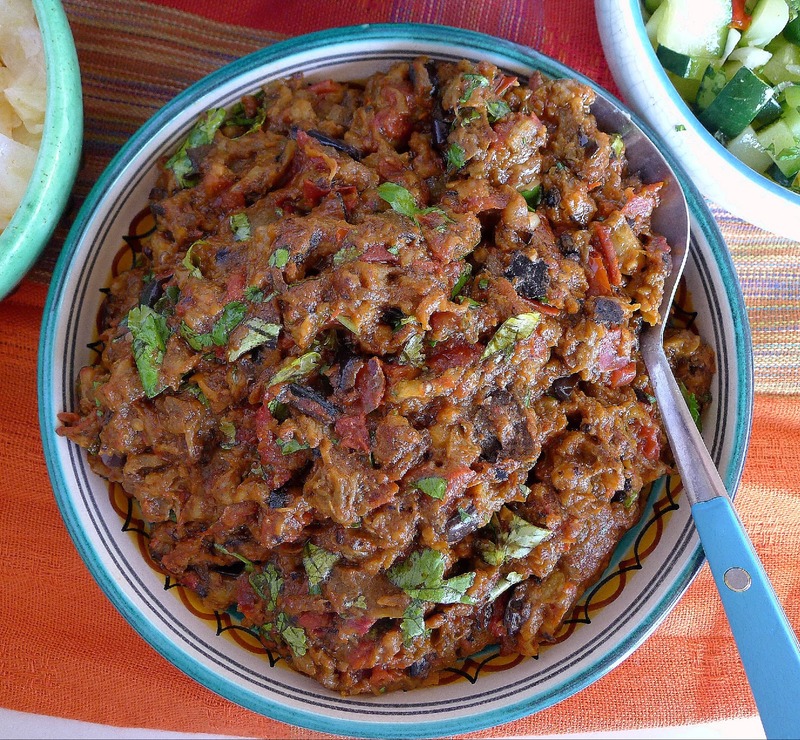 I especially liked the eggplant salad, called zeilouk, sort of a cross between baba ghanoush and caponata. 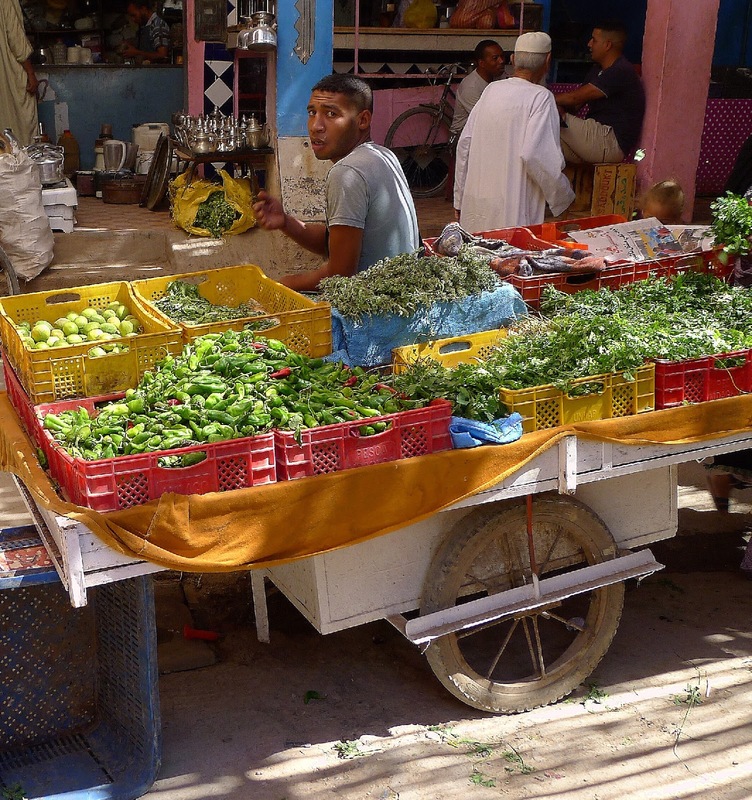 Salad ingredients at the souk in Moulay Idriss. 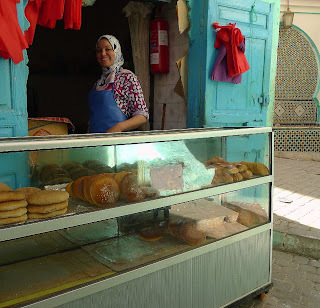 A corner bread seller in the medina of Moulay Idriss. Bread accompanies every meal. 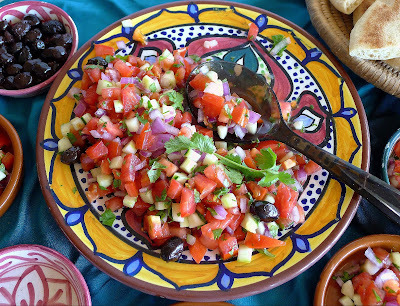 This salad is almost identical to Andalusian pipirrana. It’s good served as a starter or as a side with grilled kebabs or fried fish. The Moroccan salad may have chopped fresh cilantro instead of parsley and might have cumin or spicy-hot harissa chile paste added to it. 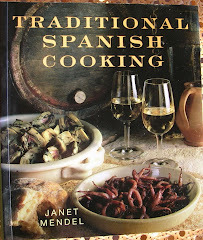 Unlike the Spanish version, it does not have raw garlic. Place the chopped onion in a bowl and sprinkle with 1 teaspoon salt. Add water to cover. Soak the onions 30 minutes. Drain. Place the onions in a bowl with the tomatoes and cucumber. Add the oil, 1 teaspoon salt and the cumin and harissa, if desired. Immediately before serving, stir in the chopped parsley or cilantro. If the salad has been prepared in advance, the tomatoes and cucumbers will release a lot of liquid. Use a slotted spoon to serve the salad onto a platter or individual bowls. Garnish with olives. This grand presentation salad includes five or more vegetables, raw and cooked, arranged on a platter around a mound of rice and nicely garnished with sliced egg and two or more sorts of olives. Here are two versions I enjoyed in Morocco. These ingredients make enough for two platters of salad, serving 8 to 10. Mound rice in the center of a two large platters. Working clockwise from 12:00, arrange zucchini, green beans, potatoes, roast peppers, chopped tomato salad and carrots. Repeat. Garnish the platter with orange slices. Scatter olives over all. Place quartered egg on top. Sprinkle with salt and drizzle oil on top. Once assembled, serve the salad immediately. Mound rice in center of a large platter. Working clockwise from 12:00, arrange sliced tomatoes, cabbage, beets, grated carrots and sliced cucumber in sections. Repeat. Drizzle oil or dressing on top. Sprinkle with pomegranate seeds.and chopped mint. 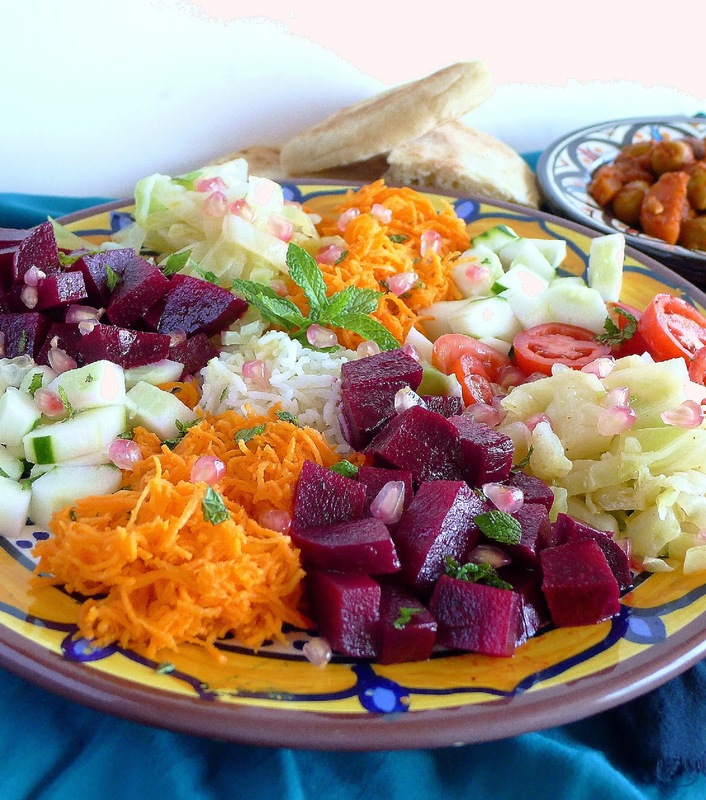 Salads in Morocco are lightly dressed with oil and lemon juice. In the south, a light vegetable oil such as sunflower seems prevalent. (I did not sample any salads with argan oil.) Around Meknes and Moulay Idris, good olive oil is produced. Vinegar is not used in Moroccan salads. Use lemon or sour orange juice to add tanginess. Salt is an essential seasoning. Cumin sometimes is added to salads or served alongside for each person to add to taste. Salt in dressing draws liquid out of ingredients. If preparing salads in advance, use a slotted spoon to lift the vegetables out of accumulated juices. The citric acid of lemon juice dulls bright green colors. Add the juice to green beans immediately before serving. Fresh herbs can be added to the dressing or, to preserve freshness and color, tossed with the dressed vegetables immediately before serving. Use 2 to 3 tablespoons of the dressing for each of the vegetable salads. Extra dressing keeps, covered and refrigerated, for up to 3 days. Cook the garlic in a little water until soft, 15 minutes. (It can be cooked with any of the vegetables.) Peel the garlic and crush it in a bowl. Stir in the lemon juice, salt, pimentón and cumin. Whisk in the oil. Makes enough dressing for grated carrot salad and beet salad. Combine the lemon juice, honey, salt and orange blossom water. Whisk in the oil. 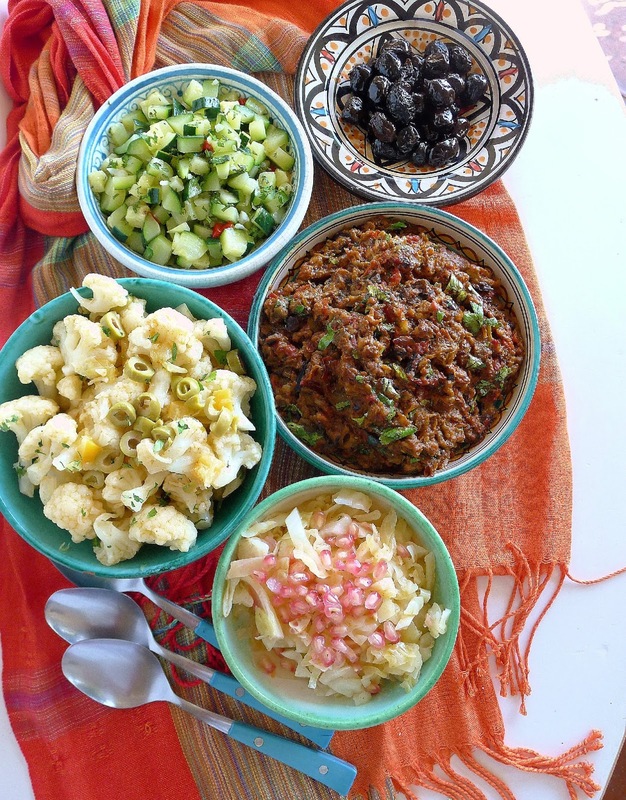 Use long-grained or basmati rice for Moroccan salads. 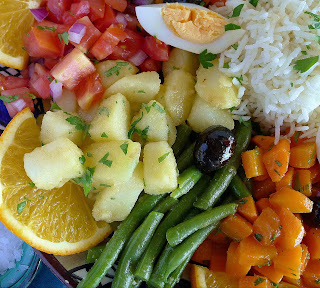 One salad I sampled in Morocco had a heap of shell pasta in the center of the vegetables instead of rice. Why not? Bring the water to a boil with the salt. Add the rice, reduce heat and cover the pan. Cook until the rice is al dente, about 12 minutes. Drain the rice thoroughly. Return the hot rice to the pan. Stir in the oil and cover the pan. When rice is cool, refrigerate until ready to use. Marinated vegetables are arranged around rice. Sweet potatoes cut in dice can be prepared in the same manner. Put potatoes and salt in pan and cover with water. Bring to a boil and cook until potatoes are tender, about 6 minutes. Drain well. Stir in the salad dressing. Let the potatoes marinate in the dressing at least 1 hour or, covered and refrigerated, up to 24 hours. Stir in chopped parsley immediately before serving. Slice the zucchini thinly crosswise. Place it on a microwave-safe plate and drizzle with oil. Microwave on high for 2 minutes. Place zucchini and juices in a bowl and add 1 teaspoon salt and the salad dressing. Marinate 1 hour or, refrigerated, up to 24 hours. 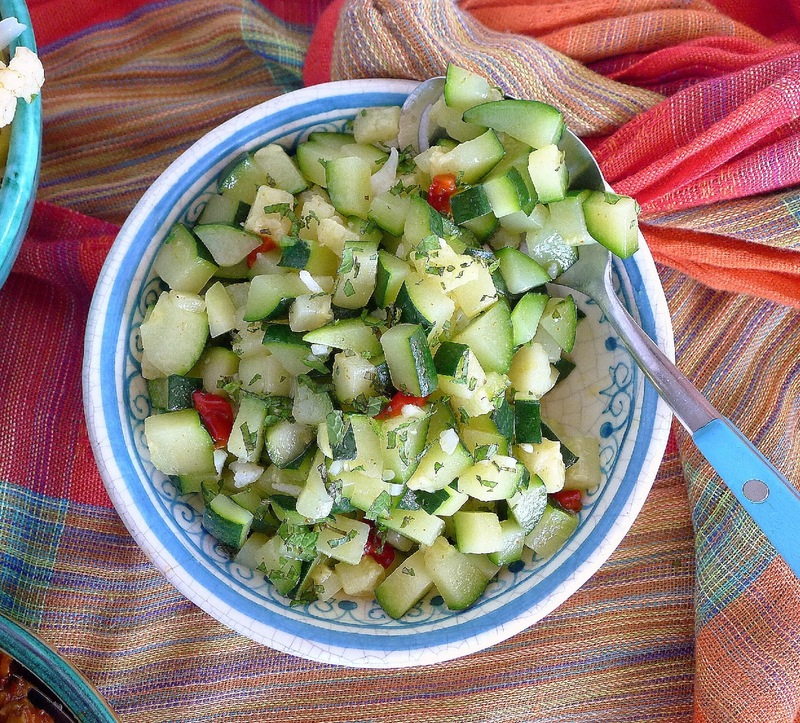 To serve, lift the zucchini out of the marinade with a slotted spoon. Sprinkle with chopped parsley. Cook beans in boiling salted water until crisp-tender. Drain and refresh in cold water. Dress with 1 tablespoon olive oil. Beans can be prepared in advance and refrigerated until serving time. Immediately before serving, stir in Salad Dressing I and chopped parsley. Butternut squash can be prepared in the same manner as carrots. Cook the carrots in salted boiling water until just tender, 4 minutes. Drain and refresh in cold water. Add the dressing to the carrots and marinate at least 1 hour or, refrigerated, up to 24 hours. Preheat oven to 500ºF. Cut peppers in half lengthwise, remove stem and seeds and place them, skin side up on a baking sheet. Roast until skins are blistered and somewhat blackened, about 10 minutes. Cool the peppers. Remove skins and pull the flesh into strips. Combine with salad dressing and marinate for at least 1 hour or up to 24 hours. Orange blossom water adds an exotic hint to this salad. Mix the carrots with salt and salad dressing. Allow to marinate 1 hour or up to 24 hours. Cook the whole, unpeeled beets in boiling water until they are tender when pierced with a skewer, about 15 minutes. Drain. When beets are cool enough to handle, slip off the skins. Cut the beets into ½-inch dice and place in a bowl. Sprinkle with salt and pepper. Stir in the salad dressing. Marinate at least 1 hour or up to 24 hours. Stir in chopped mint right before serving. These salads are served in individual bowls instead of on a single platter. Clockwise from top left are chopped zucchini salad, black olives, eggplant salad, coleslaw with pomegranates and cauliflower with preserved lemon and green olives. Bring a pan of salted water to a boil. Add the cabbage. Return the water to a full boil, then remove from heat and drain the cabbage. Refresh it under cold water. Place in a bowl and season with 1 teaspoon salt and pepper. Add the salad dressing. Let the cabbage marinate at least 1 hour or, refrigerated, up to 24 hours. 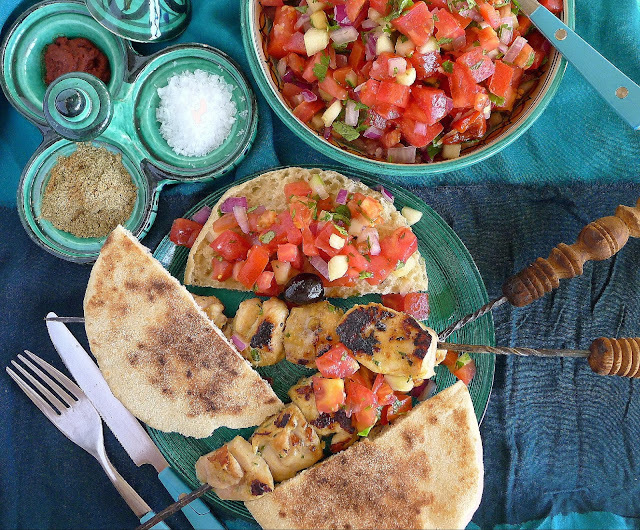 Sprinkle with pomegranate seeds and chopped mint immediately before serving. Serve this salad as a dip or spread. Use a potato masher to smash the softened eggplant and tomatoes. It should be mushy, not pureed. The mixture turns very dark as it cools. Peel the eggplant in stripes, leaving some of the peel. Cut the eggplant in half lengthwise and slice them crosswise. Heat half the oil in a heavy skillet. Brown half the eggplant slices on both sides. Remove them from heat. Add remaining oil and eggplant to skillet and brown. Remove the eggplant slices. Add the chopped garlic and tomatoes to the skillet. Return all of the eggplant to the skillet. Season with salt, pimentón, hot pimentón and cumin. Cover and cook, stirring occasionally, until eggplant is very soft, about 20 minutes. Mash the eggplant and tomatoes with a potato masher. Return to heat and cook, uncovered, until the mixture is thick and no liquid remains. Remove from heat. Let eggplant cool, then stir in parsley and lemon juice if desired. Serve room temperature with bread to accompany. Salty preserved lemons and olives give cauliflower some character. Cook the cauliflower in boiling salted water until crisp-tender, 3 to 4 minutes. Drain and refresh in cold water. Place in a bowl and add ½ teaspoon salt, the salad dressing and chopped preserved lemon. Marinate at least 1 hour or, refrigerated, up to 24 hours. 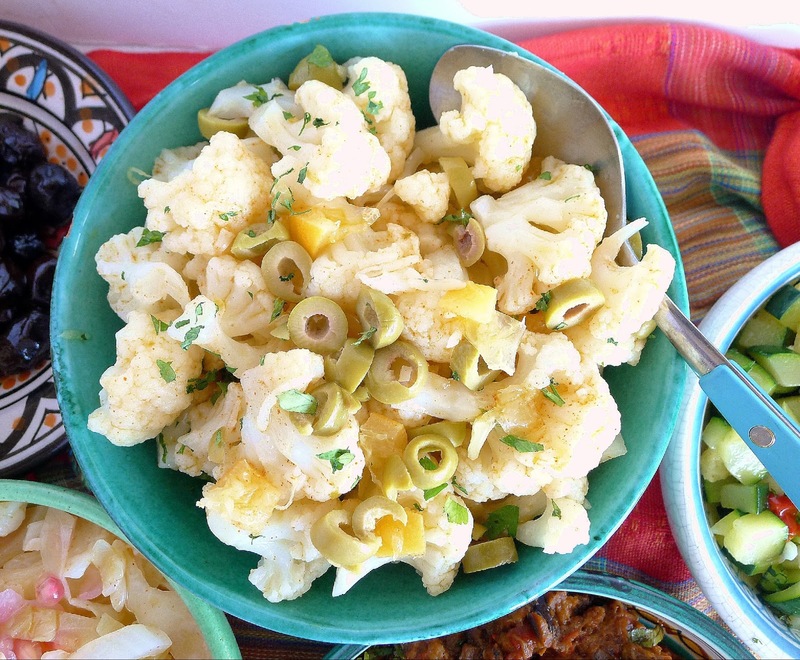 To serve, scatter sliced olives and parsley on the cauliflower. This simple salad packs a lot of flavor. The trick is to keep the diced zucchini crisp. This salad does not need marinating time. Serve it freshly made. Combine 2 teaspoons salt with the water. Bring to a boil and add the diced zucchini. Cook 2 minutes. Drain and rinse in cold water to stop the cooking. 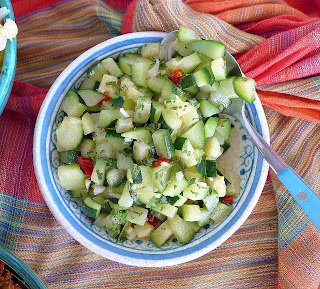 Place the zucchini in a bowl and sprinkle with ½ teaspoon salt. Add the salad dressing and chopped onion, if using. Immediately before serving, stir in chopped mint. 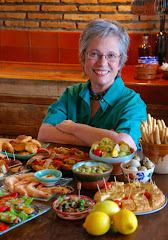 (Note: All of the salads pictured here were prepared and photographed in my kitchen in Spain. Tagine of Chicken with Lemon and Olives. 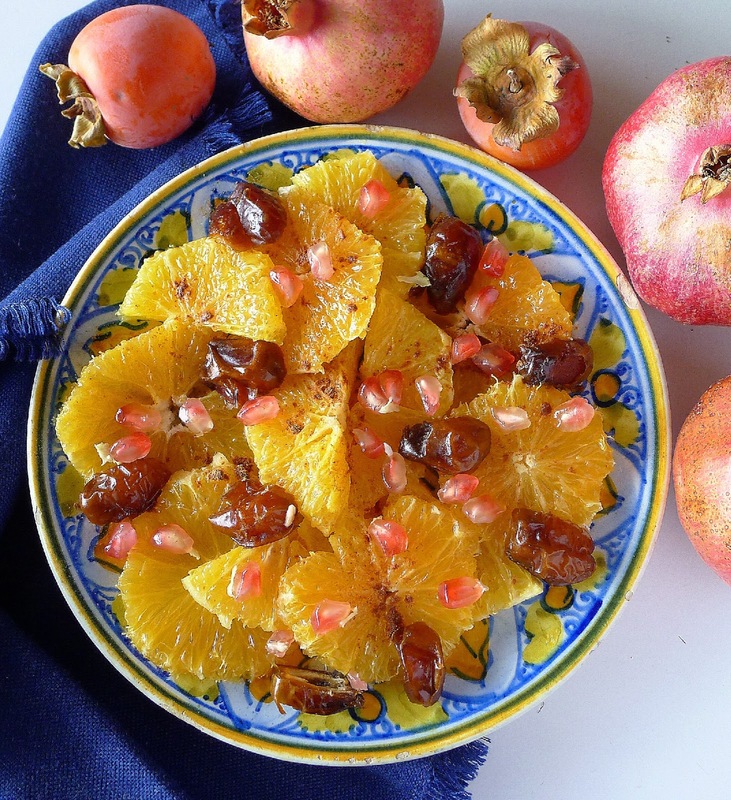 Andalusia's twin to Moroccan salad: Pipirrana. Chopped tomato salad is the perfect accompaniment to grilled chicken brochettes served with Moroccan bread. Salt, cumin and harissa are on the side. The skewers with cedar-wood handles I bought in Morocco 50 years ago.